You may find yourself frequently on the practice range working to perfect your golf swing, and hoping it helps you perform better on the golf course. When you move from the driving range to the golf course, take into consideration the balls you're using. Range balls are usually different from golf balls used for distances on a course. Even with a consistent swing, you'll notice some distance variation between the range and your game. The majority of the balls that you will encounter on golf course practice ranges will not provide you with the same distance performance as the balls you put into play when you are competing. Some balls are intentionally designed to be limited in flight, especially if the practice range is limited in terms of space. You will be able to identify a limited flight range ball because it seems to dive to the ground once it reaches its peak height. Just as dimple patterns are being tweaked and perfected to maximize aerodynamics and to maximize carry distances for golf balls used competitively, the dimple pattern on a limited flight ball is designed to create more drag, thus limiting the flight of the golf ball. The challenge golf ball manufacturers face is to provide the feel and flight pattern of a normal golf ball while still reducing the distance the ball travels. Some golf professionals are of the opinion that if the distance limits for golf balls aren't reigned in, many golf courses will become obsolete. For this reason, a golf ball manufacturer created a ball which weighs 24 grams, compared to the approximately 45 grams of a golf ball. This style of ball -- achieved with a unique dimple pattern -- were originally designed for smaller courses. These limited distance balls are also being used on some ranges that have a limited amount of space. If you attend a PGA Tour event, spend time watching the players practice on the range. Take particular notice of the practice balls being used — they are not the typical range balls with stripes. In fact, they are not range balls at all. The reason is that golf professionals are so precise about their distance control, they will not hit normal range balls due to the performance gap and lack of predictability. When you head to the range, don't focus on distance, as most range balls will not perform the same as the ball you will put into play once you get to the golf course. 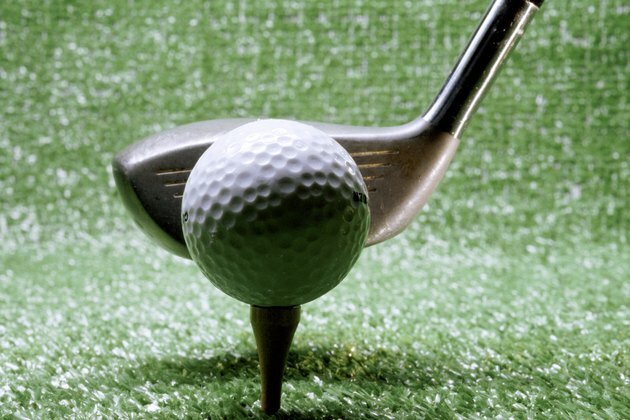 Expect the range balls to fly 10 to 15 percent shorter than a normal golf ball. A limited-flight range ball could be 20 to 30 percent shorter. Focus instead on timing and solid contact. How Many Calories Do You Burn Going to the Driving Range for an Hour?